It’s World Diabetes Day. 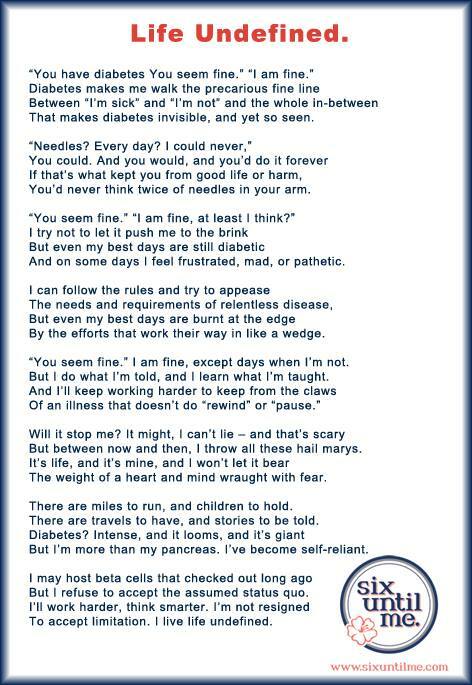 And how do I feel, after 30 years with type 1 diabetes under my belt (and above my belt and in every organ and all over my face)? LUCKY. Effing lucky. Because according to the demands of my body, I should not be here, but because of science and access, I am alive. I clicked on the Google homepage today and saw that, finally, after years of asking and hoping to see Google acknowledge the diabetes community through a Google doodle, our community was highlighted on the homepage. There we were, represented in retro fashion, alerting the world that people with diabetes would be absolutely sunk without the contributions of Dr. Frederick Banting almost 100 years ago. If I had been diagnosed before Banting and his crew changed the diabetes world, I would have died, my body starving to death as a result of not making insulin. Insulin is crucial to my survival. Seeing 90 days worth of insulin collected in my kitchen is pretty damn humbling. What keeps me alive is stored next to the butter in my fridge, and that’s beyond humbling. I do not take this life for granted. Today, on World Diabetes Day, more people are paying attention. Even this whole month, with the focus on diabetes, people are tuning in and listening. We have their ear. So grab them by that ear and remind them that diabetes month is November, and diabetes day is today, but diabetes is EVERY DAY for people touched by it. We’ll still be stashing our butter compartments with insulin in December, and every December after that. How can people help, way past today and this month? People can donate to the International Diabetes Federation’s Life for a Child program. They can also gear up for the Spare a Rose campaign, which takes place every February. If your butter compartment is stashed with insulin, consider those who don’t have access and please help. You can donate directly by clicking here. They can also explore some of the diabetes advocacy organizations, like the JDRF or American Diabetes Association, or some of the more grassroots groups like Children with Diabetes, the Diabetes Hands Foundation, Riding on Insulin, the Betes Organization, Nightscout Foundation, Diabetes Sisters, DPAC, ConnecT1D, the Diabetes Community Advocacy Foundation, DOColors, or Glu. Or any of the other ones I haven’t listed, because there are many. Participate in the Big Blue Test, or the World Diabetes Day 24 hour chat (#WDDchat16). Or share their stories through the JDRF, ADA, or IDF campaigns. You can do that RIGHT THIS SECOND. If healthcare professionals are checking in on this post, please consider recommending the diabetes online community as a resource for your patients. AADE President Hope Warshaw has created a one-sheet to help HCPs jump into the space, and there’s always the #DSMA chats that take place on Wednesday nights at 9 pm eastern. Peer-to-peer connections can make all the difference for your patience. Please encourage exploring the DOC as an option for your patients. And give. Give financially to organizations that lift the message you want lifted. Give your time to efforts that improve the diabetes experience. Give your story life outside of the diabetes bubble and give the gift of education and information to people who aren’t familiar with diabetes. World Diabetes Day 2013. The Patient Voice 2016: Bridging the Diabetes Gaps Spare a Rose 2016: Final Totals. D-Blog Week: Change One Life, Change the World. At 42 years I feel the same. I never expected to make it this long. Thanks to technology, and some very good fortunate I have. Every day is a bonus. Your poem is so great. Speaks from my heart. An excellent and spot on presentation. Thoughts and prayers for you and the past, current and future diabetics until we have a cure.